If you're going kayaking or canoeing for the first time, take lessons. Even if it isn't summer, you should still wear sunscreen. Be sure at least one person on your boat knows how to operate it properly. 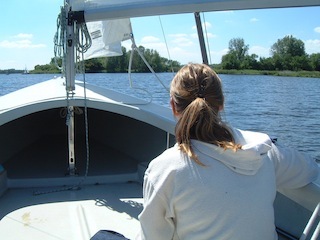 Preferably everyone would have basic seamanship and boat maintenance skills but, if not, there should be at least one or two people who know how to drive the boat, navigate and fix things if need be. You may want to take a boating class or 'study up' on the subject. Make sure all of your equipment is up-to-date and has been properly maintained. Know the limits of your boat (maximum capacity, etc). Carry a lighting device such as a large flashlight in case it gets dark while you are out. Lights will also help in seeing what's under the surface of the water. Always carry floatation devices such as lifejackets and rafts. Make sure there are enough devices on board for everyone and that everyone knows how to use them properly. Be sure you know how to swim. This sounds obvious, but a lot of people don't swim as well as they think they do. Even if you are an expert swimmer, you should still wear a lifejacket to help you stay afloat. Check the weather forecast. Find out about the tides and conditions of the waters. Be aware of any local or federal regulations. Be aware of your surroundings, especially of anything below the surface. You don't want to accidentally hit your boat up against a reef or run aground in a shallow area. If you are in waters that host any kind of animal (jellyfish, alligators, stingrays, etc), keep a lookout for them. Carry air horns, flares or other attention-getting devices in case you need to signal for help. Also, carry a working fire extinguisher, especially if you are using a motor boat. Oil and other electrical parts tend to be very flammable, especially if you've had an accident or something goes wrong with your boat. Don't Drink and Boat! Steering a boat while under the influence can be just as dangerous as driving a car. In fact, about 50% of fatal accidents while boating are alcohol-related. If there is going to be alcohol on your boat, please select a designated driver! These are only a few of the things you would want to know before you set out on a boating trip. Some helpful websites are Commander Bob's Boat Safety Notebook (http://www.commanderbob.com), the Sea Tow Foundation (http://www.boatingsafety.com/) and the US Coast Guard's website. "Be aware of any local or federal regulations." -Especially this one. Believe me the game warden is always around when you least expect it. Playing innocent doesn't always work.